Israeli Occupation Forces (IOF) suppressed the weekly peaceful marches in West Bank in solidarity with prisoners and Jerusalem. The marchers also called for revealing Arafat's killers. Dozens of injuries were reported among Palestinian civilians and solidarity activists in Bil'in village, west of Ramallah, after Israeli forces fired tear gas bombs at the weekly march. The solidarity march was organized by Popular Committee against the Wall and Settlements in Bil'in to mark the ninth anniversary of former Palestinian President Yasser Arafat's death. IOF fired rubber coated metal bullets and teargas bombs at the participants once they reached the Apartheid Wall, causing several injuries among Palestinians and foreign peace activists. In Ma’sara village, in Bethlehem, a popular march was organized with the participation of a German delegation where the Palestinian and German flags were raised near the Apartheid Wall, in memory of Arafat. In turn, Israeli forces fired tear gas bombs at the participants, injuring a number of them, in addition to arresting a French peace activist. On the other hand, Israeli settlers continued their attacks and violations against Palestinian farmers in different parts of West Bank. Israeli settlers attacked Palestinian farmers in Jamma'in town in Nablus where they fired bullets in the air and detained a Palestinian farmer. Settlers have also tried to storm Tekoa, to the southeast of Bethlehem, and closed the town's entrance. Israeli sources have reported that two Israeli settlers have been injured after a Palestinian hurled a Molotov cocktail at their car as it drove on road #356 close to the Efrat settlement, south of the West Bank city of Bethlehem. The sources said that the settlers suffered minor injuries, and that the army and the police initiated a search campaign in the area. The Israeli military stated that the car was completely burnt after the settlers left it, and that the injured were moved to the Hadassah Ein Karem hospital in occupied Jerusalem. 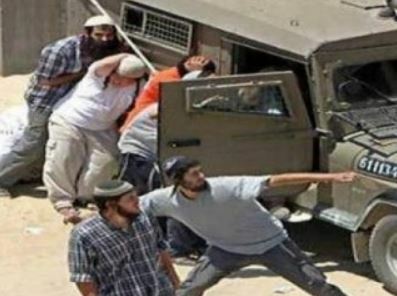 In related news, extremist Israeli settlers attacked a number of Palestinian farmers near Jama’in village, in the northern West Bank district of Nablus, chased them and detained one. 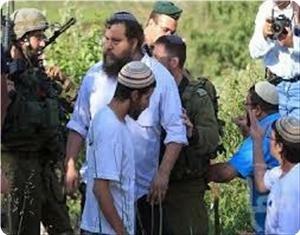 Eyewitnesses said the settlers fired rounds of live ammunition into the air before detaining Hammoud As’ad, 37. Palestinian farmers in Jama’een village, on the road between Nablus and Salfit, said that a group of Jewish settlers attacked them while working in their fields on Friday. Mohammed Zaitawi, a farmer, said that the settlers including one armed with an automatic rifle attacked the farmer Mahmoud Assad while tending to his land near Tafuh settlement. He added that the armed settler fired in the air to terrorize Assad. 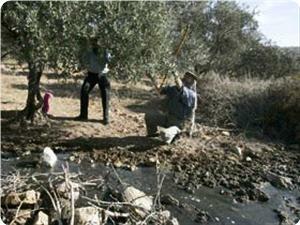 The same group attacked other farmers who were pruning their olive trees to the east of Ariel settlement. 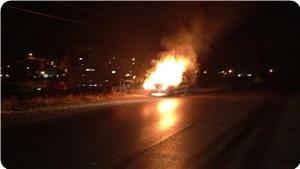 Jewish settlers torched a Palestinian car near Bani Naim village in Al-Khalil province and damaged another one. Palestinian police sources told Quds Press on Thursday that the settlers sprayed racist graffiti on the wall of the owner of the two cars’ house calling for wiping out Palestinians and drew on it the Star of David. They said that the settlers burned down a car and smashed the window glass of the other in an area adjacent to 60 bypass road. Meanwhile, Israeli occupation forces arrested a young man in Arub refugee camp to the north of Al-Khalil and set up a roadblock at the northern entrance of the city and roamed its various suburbs without any arrests reported. A group of Israeli intelligence elements on Wednesday morning stormed the Aqsa mosque in the occupied city of Jerusalem and toured its courtyards. Al-Aqsa Foundation for Endowments and Heritage pointed in a statement that nearly fifteen elements of Israeli intelligence services stormed the Aqsa courtyards and toured it. It noted that the mosque courtyards are witnessing a state of extreme tension, and that the Israeli police forces and special units reinforced their presence there in anticipation of the escalation of the situation. 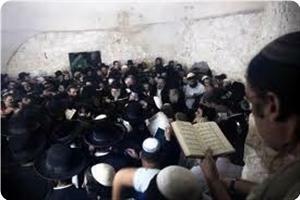 It also stated that four Jewish settlers stormed the Mosque on Wednesday morning from the Magharba gate, and toured its squares under the protection of police forces and special units. The organization warned of the seriousness of the Israeli police violations against the sanctity of Al-Aqsa Mosque, and called on worshipers to flock to Al-Aqsa and intensify their presence there in order to defend it from the occupation abuses. Al-Aqsa Foundation for Endowments and Heritage said Israeli groups seek to enact laws and regulations aiming at partitioning the Aqsa Mosque between Muslims and Jews, and defining times and areas where collective and individual Jewish prayers can be held. 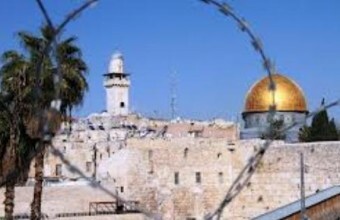 The Foundation said in a statement that Israeli ministers, MKs and party members, in addition to Israeli organizations and decision-makers, are seeking to reach a political and religious consensus to change the status quo in the Aqsa Mosque, and turn it into a Jewish holy site under the occupation authority. It stated that the Knesset Interior Committee held on Monday a session in this regard, attended by Deputy Minister of Religious Affairs Eli Ben Dahan who called on the new "Chief Rabbinate" to issue an advisory opinion allowing Jews to pray at Al-Aqsa Mosque. For her part, the head of the Knesset Interior Committee Mary Rigab - from the Likud party - pointed out that holding consecutive sessions aims to enact regulations that will define the times and areas where Jewish prayers will be held in the "Temple Mount", regardless of the opinion of the "Chief Rabbinate", and regardless of the threats of a third intifada. 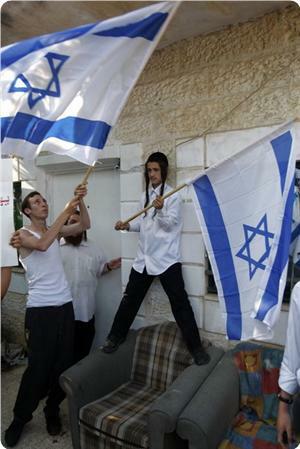 Dozens of Jewish settlers took control of a number of houses in Al-Khalil on Tuesday under protection of Israeli occupation forces (IOF). Local sources said that the settlers occupied homes of Qufaisha and Abu Snene families in the Old City of Al-Khalil near to the Ibrahimi mosque. The sources said that IOF soldiers secured the way before settlers, adding that those settlers want to establish a settlement outpost near the mosque to prevent worshipers from entering it or even living near it. The settlers had earlier occupied other homes in the Old City under IOF protection in line with their scheme to Judaize the city. Al-Aqsa Foundation for Endowments and Heritage said Israeli groups seek to enact laws and regulations aiming at partitioning the Aqsa Mosque between Muslims and Jews, and defining times and areas where collective and individual Jewish prayers can be held. 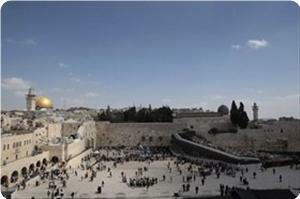 The Foundation said in a statement that Israeli ministers, MKs and party members, in addition to Israeli organizations and decision-makers, are seeking to reach a political and religious consensus to change the status quo in the Aqsa Mosque, and turn it into a Jewish holy site under the occupation authority. For her part, the head of the Knesset Interior Committee Mary Rigab - from the Likud party - pointed out that holding consecutive sessions aims to enact regulations that will define the times and areas where Jewish prayers will be held in the "Temple Mount", regardless of the opinion of the "Chief Rabbinate”, and regardless of the threats of a third intifada. The driver of a Palestinian truck was attacked by two settlers with a bat near the entrance to Beit Ein in Gush Etzion. The driver was lightly injured. 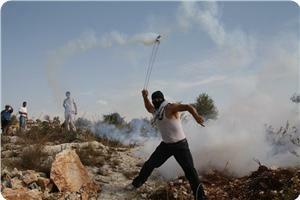 The masked attackers also sprayed pepper gas on two soldiers who were securing the settlement gate. After the attack, they fled the location. IDF forces are looking for the attackers. 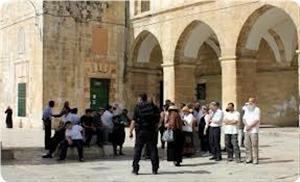 Dozens of Jewish settlers led by a rabbi broke into the Aqsa Mosque in occupied Jerusalem on Thursday morning. The Aqsa Foundation for Endowment and Heritage said in a statement that around 30 settlers including women and children entered the holy site via the Maghareba gate. It said that a rabbi led the group on a provocative tour of the mosque’s courtyards and came too close to students then sat not far away from them and the rabbi started to give instructions and tried to offer Talmudic rituals amidst explanations on the alleged temple. The students and Aqsa guards were provoked by the tour and started shouting at the settlers, who were escorted by Israeli special forces, until the settlers were forced to get out of the holy site. 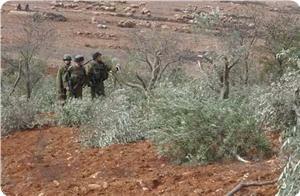 Jewish settlers chopped down and incinerated more than 600 olive trees in Ainbus village, south of Nablus. 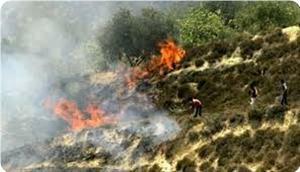 Ghassan Daghlas, an activist monitoring settlement activity north of the West Bank, said on Thursday that the trees were chopped down or burnt with chemical materials in Amayra area to the north of the village. He said that owners of the land, near to Yitzhar settlement, discovered the “crime” when they headed on Wednesday to harvest their crops. He pointed out that the land owners could not reach their land unless they obtained a permit from the Israeli occupation out of fear of settlers’ attacks. Daghlas said that many of the trees, which are owned by three families, were cut off a long time ago as the olives on them were small in size. 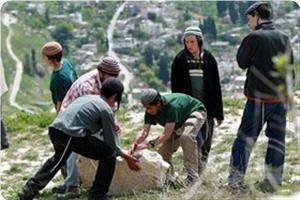 Dozens of Jewish settlers stormed Nabi Yusuf tomb to the east of Nablus city at dawn Thursday and performed rituals. The settlers arrived to the scene in eight buses escorted by 20 army jeeps that secured the area for the settlers in coordination with PA security forces. The IOF soldiers fired sound bombs for hours before arrival of the settlers and raided nearby suburbs and refugee camps and clashed with young men, who tried to confront the settlers’ repeated storming of the site. Inhabitants said that the settlers along with the army soldiers retreated by the early morning hours from the site toward the nearby Elon Moreh settlement. The Israeli human rights organization B'Tselem on Wednesday released video footage and photos of an Israeli settler attack on Palestinian farmers. B'Tselem said in a statement that on Oct. 26, masked Israeli settlers approached the Palestinian village of al-Mughayir and attacked the Naasan family with stones while they were harvesting olives. "The family responded by throwing stones back," the statement said. 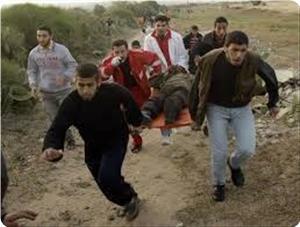 "The settlers then assaulted 75-year-old Ghatib Naasan and his nephew, Yasser Naasan, who tried to protect him. The latter, a volunteer..., was hit with an iron bar and broken glass. His head and hand were injured." The settlers, from the nearby illegal settlement of Adei Ad, also shattered Naasan's windshield and broke his camera, according to the statement. B'Tselem Director Jessica Montell was quoted in the statement, saying: "It is the duty of the military, which is fully responsible for the said area, to prevent this absurd situation whereby farmers cannot harvest their olives for fear of being attacked by settlers, who are living there in contravention of international and Israeli law." Naasan filed a complaint at a nearby Israeli police station the next day and B'Tselem is following the police handling of the complaint, the statement said. 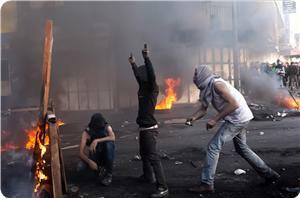 attacks on Palestinian civilians and property. Palestinian farmer Osman Balasma, from Salfit, was admitted to the intensive care unit in Martyr Yasser Arafat hospital in the city, after a serious deterioration in his health condition. The doctors confirmed that Balasma is dying, as he suffers from a sharp drop in heart rate, lung infection and severe other symptoms in different parts of his body. The Palestinian farmer started to suffer from lung infection as a result of the continued inhalation of toxic gases emitted from Israeli factories set up next to his house. Blasma had refused all along to leave his land in Ezbet Abu Basal, so that the Israeli settlers will not seize it. Residents of Bruqin village west of Salfit complained about the health crisis caused by the continuous flow of settlements sewage near their homes. The villagers called on the competent authorities and human rights organizations to stop this phenomenon, that turned the life in their town into a painful reality, especially in ​​the valley area. The residents expressed anger due to the bad smell and the big numbers of mosquitoes, that are causing many diseases, especially for children. Dozens of Jewish fanatic settlers stormed the Aqsa Mosque in occupied Jerusalem on Wednesday morning amidst tight security measures. Mahmoud Abu Ata, information director at the Aqsa Foundation for Endowment and Heritage, said in a press statement that more than 30 Israelis broke into the holy site in groups. He added that the settlers toured the mosque’s various plazas and tried to perform Talmudic rituals but the presence of hundreds of students and their shouts of Allahu Akbar prevented the settlers’ from completing their rituals. 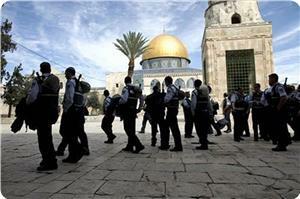 Special Israeli police forces guard the settlers in their daily storming of the Aqsa Mosque. Abu Ata said that the Jewish fanatic groups aim at dividing the Aqsa Mosque spatially and temporally with their daily tours of the holy site, adding that on Tuesday 85 settlers and students entered the Aqsa Mosque and toured its various courtyards. The Israeli government has discussed with a special committee a Judaization project that aims at turning Buraq Square into a large Jewish synagogue divided into three sections. Al-Aqsa Foundation for Endowment and Heritage confirmed in a press statement on Tuesday evening that the occupation seeks to turn the entire Islamic site into a Jewish Synagogue used for Jewish prayers and official decrees aiming to blur Islamic monuments. Two governmental committees have been formed at the behest of Netanyahu to follow up the Judaization project, the Foundation added. The supposed synagogue extends 150 meters starting from the south-western corner of Al-Aqsa Mosque, passing through the Bab-al-Magharibe and Buraq Wall till Tankaziya School north of Buraq square. The Foundation stated that the construction work has been already started two months ago and it will be completed after the approval of the project. The Islamic-Christian Commission for the support of Jerusalem and holy sites warned on Tuesday of the occupation authority's intention to organize a large Jewish festival in the occupied city of Jerusalem over a whole month. 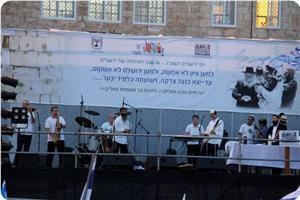 The Commission said in a statement on Tuesday that these festivals are part of the judaization plan that targets the city of Jerusalem. It noted that the festival to be held will revive “the glories of the Evangelical revolutions and the campaigns in the late Middle Ages,” and aims to attract the maximum number of tourists and Jews, to change the character of Jerusalem and to distort its history and ancient civilization. The Secretary-General of the Commission Dr. Hanna Issa considered the festival which will kick off on Thursday a judaizing step and a violation of the sanctity of the holy city and the Christian and Islamic holy places. The Commission called for denying and refuting all the Jewish allegations which will be presented during this festival by shedding light on the history of Jerusalem, its culture and sanctity. It also warned that the occupation authorities and settlers are now using all the means and methods to Judaize Jerusalem, to impose their control over it and to build the alleged Temple. Dozens of Jewish settlers broke into the Aqsa Mosque on Tuesday morning amidst tight security measures by Israeli special forces. 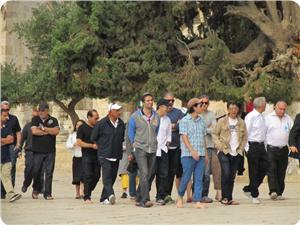 The PIC reporter said that 33 settlers broke into the holy Islamic site and toured its various courtyards. He added that 56 Israeli school students also broke into and desecrated the Aqsa Mosque, adding that they were 6 to 16 years old. 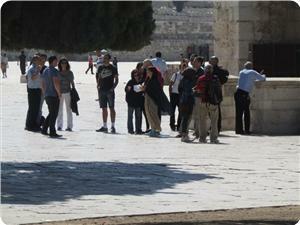 The Aqsa Foundation said that the settlers toured the holy site in one group, describing their tour as “provocative”. It said that hundreds of vigilantes and scholars were inside the mosque and expressed utter dismay at the repeated violations of the mosque’s sanctity. One of the settlers tried to perform Talmudic rituals but was taken out of the mosque after he provoked vigilantes, one of the Aqsa guards said. He added that Israeli occupation forces arrested Muhanad Idris, one of the Aqsa guards, after storming his neighborhood. 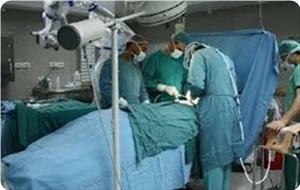 An old Palestinian farmer in Salfit was transferred to hospital on Sunday after inhaling poisonous gases coming from the industrial area in nearby Burkan settlement. Local sources said that Othman Jaber suffered from serious inflammation and vomiting, adding that he was taken to hospital where doctors told him his lungs were affected by the gases and were in serious condition. Jaber’s house is near to the settlement, which is to the west of Salfit, making him and his family the most affected along with other neighbors from the poisonous winds. The air pollution blowing in from Burkan, which is situated upwind of Salfit, will continue to cause health risks for the town’s residents. Local sources have reported [Monday October 28, 2013] that a number of extremist Israeli settlers attacked a Palestinian man in his own land, near the northern West Bank city of Nablus, before settlement guards kidnapped him instead of removing the settlers. The sources said that the settlers violently attacked Mohammad Qabha, 45 years of age, striking him repeatedly to different part of his body causing various injuries. Qabha is from Sinjil village, near Ramallah; the settlers came from Maale Labouna illegal settlement south of Nablus. Settlement guards then kidnapped the man and took him into the illegal settlement. Earlier on Monday, Israeli soldiers invaded various districts in the occupied West Bank, and kidnapped 23 Palestinians before taking them to different interrogation and detention facilities.